Today was pretty cool. We got all the fabricating on the showroom components done. Tomorrow I can start the priming and painting on those. Then they're ready for delivery. 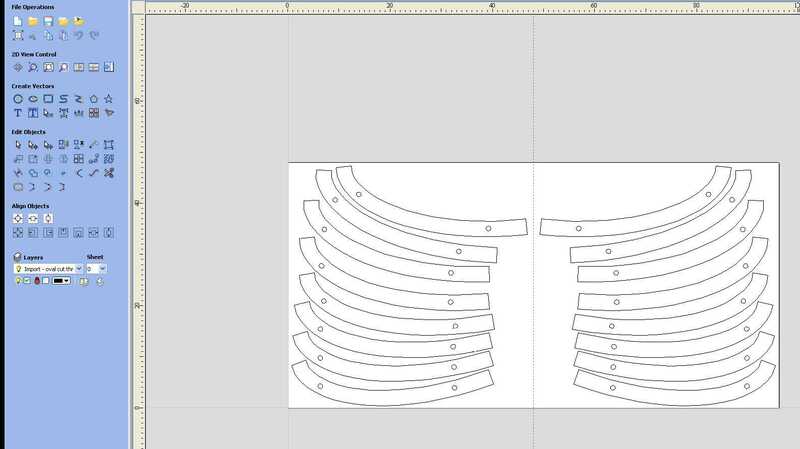 I still have to finish drawing all the vectors for the cool table we have to start ASAP. I really like the challenge of drawing all the parts in 2D vectors while trying to stay 3 steps ahead in-case I box myself into a corner. 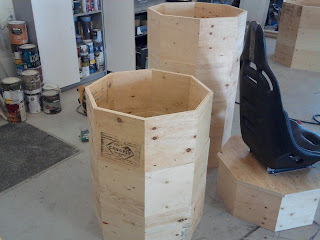 A corner that usually rears it's ugly head AFTER the parts are cut! 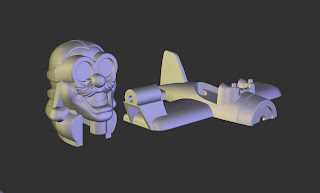 I also received the proper file for Louie, so I will spend the weekend getting those prepped for machining at the beginning of the week. I think our HDU deliveries are Tuesdays and Thursdays, so I better get my order in soon! I am quite excited today. Like a little kid. Loopin Louie arrived at my doorstep courtesy of UPS this morning. Loopin Louie is a kids game from back in the day. 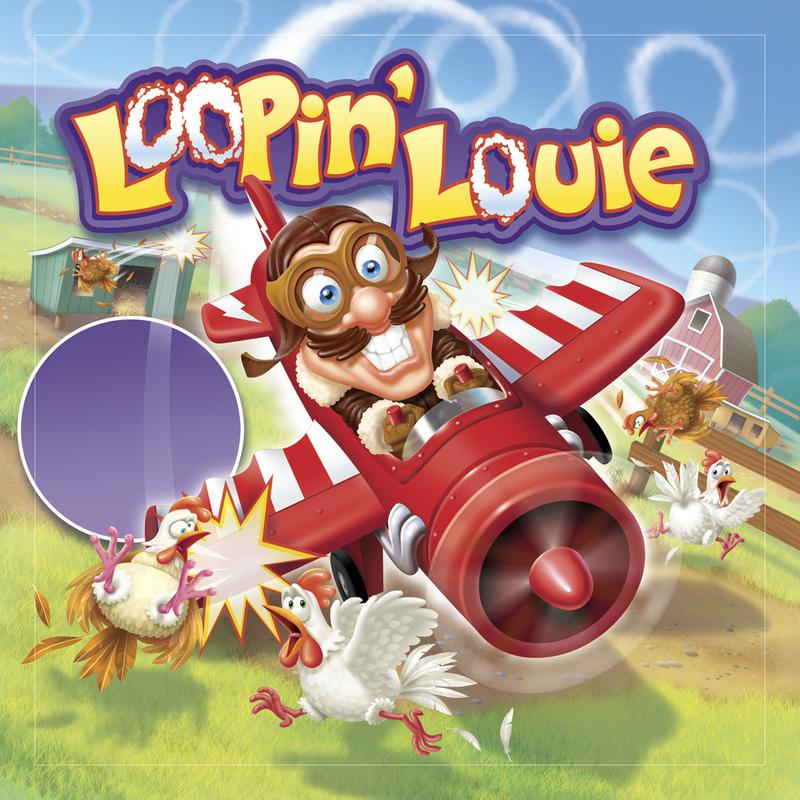 I do believe it's getting a re-release, and we have been asked to make a large version of Louie piloting his little red plane. Our version will have a 3 foot wingspan! After we're done, he will be flying all the way to Dallas for display. 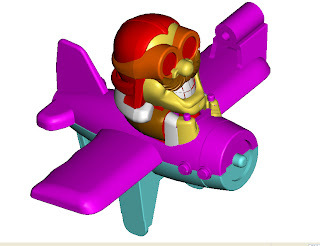 I received the files for him today, but they were in DWG format. You guessed it, no 3d data, just outline vectors. So with a quick email sent, I should have the files from Hong Kong any time now. I love computers and the internet! This job is gonna be fun for sure. 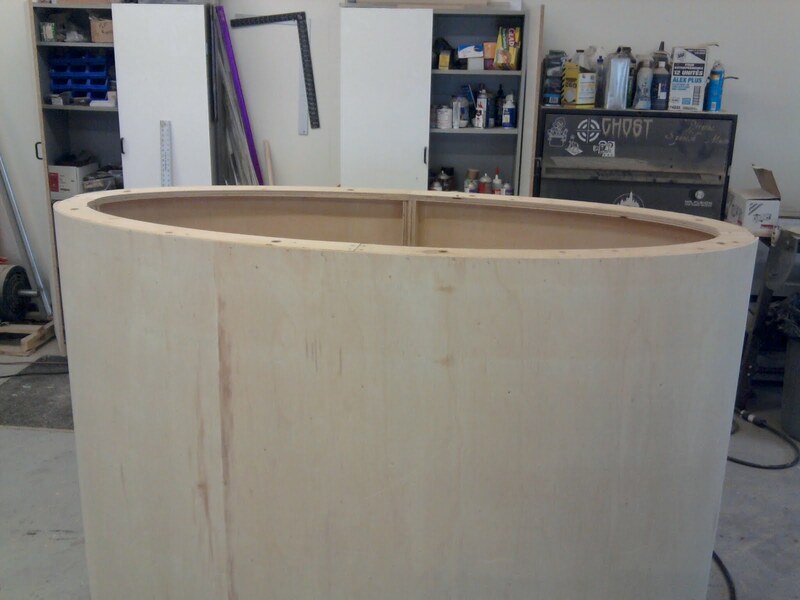 While we are waiting for that, we have started work on the Spinmaster showroom stuff we were awarded. The one section is pretty straight forward, but there is a table for another part of the showroom that has me pretty excited as well. It's kind of a giant mechanical looking piece. That's what I'm talking about. 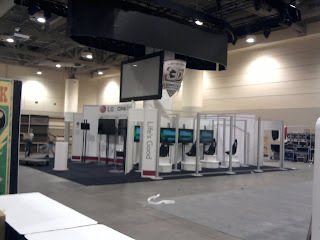 No pictures again today :( The LG booth teardown started right as Fan Expo ended at 6 pm on Sunday. The whole place was buzzing with people tearing down their booths. We got started right at six. The super sweet Octanorm components detached from each other really quickly. This time we had 4 people to teardown and crate everything. A far cry from the 2nd install day. I was shocked when 9 pm came and the whole booth was torn down and skidded, with the exception of the center column. This part however, took a fraction of the time to get down as compared to putting it up. All said and done, we had everything packed, skidded and hand carted over to the waiting area to be loaded onto the truck at 11:30pm. That was pretty great, I don't mind saying. I was however, quite exhausted, by the time I got home at 1:30am. I decided that I was going to sleep in today and then finish the cleaning at the shop before the new build due on Friday. I sense a new shop mess a comin' my way. And with any luck, it will be even MORE spectacular than the last one! I think I need the U.N. I think I need the U.N. Not for peace keeping, but for cleaning up the aftermath of the LG nuclear weapon that seems to have detonated in the middle of the shop. It seems the carnage has spread to the unit we rented next door as well. This is going to be a VERY long day. I try to keep the shop clean as we go, but it never totally works out for me. We have a multitude of jobs lined up in the queue. Some of these are going to be really awesome (for me anyways). I am most excited about 2 in particular. One is a large model from an older kids game, and the other is 21 architectural style buildings for a billboard ad. The buildings will vary in scale as each one represents something different. I know I am being a little vague, but I'm not sure how much I can say at this point. 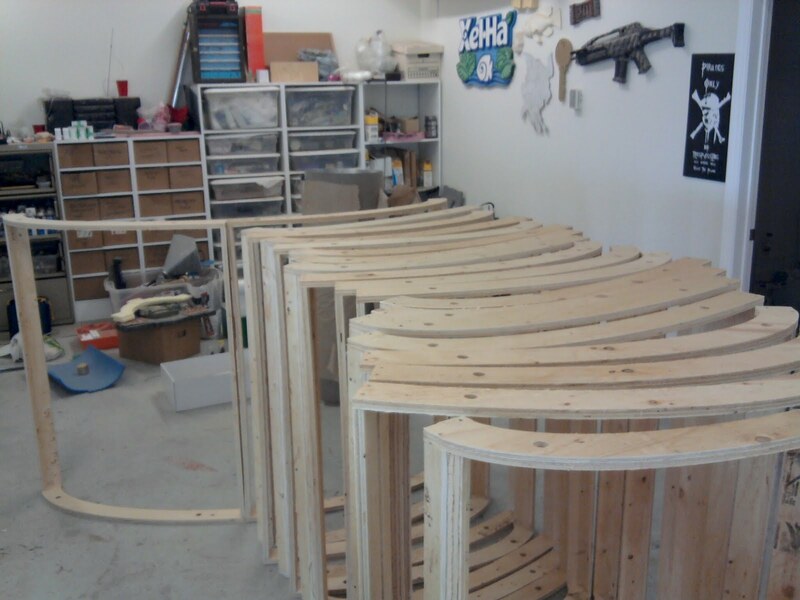 Throw in a couple of chair molds for Disney, and a small tradeshow booth, and BAM, the shop will probably need the U.N. again. I think I am blogging at the moment to put off the the fact that I'm sitting at ground zero right now. I just hope that my call to the clean-up fairies got through. 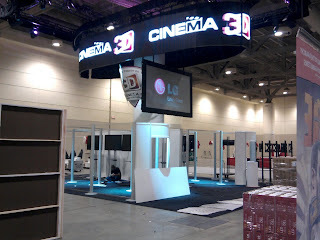 Another long Trade show day. Tuesday was another very long day. Both of the guys I had scheduled for the Monday only install weren't able to come on Tuesday. So this left the entire install to Jody, myself and my daughter Madison. We were told the center column would be going up at 9:30 am. In truth, they weren't ready for the column until 12:30. We also couldn't do anything else until the 30'X50' truss system was at least 10' off the ground. So nothing really got started until then. When we were able to start, the install plan got changed. 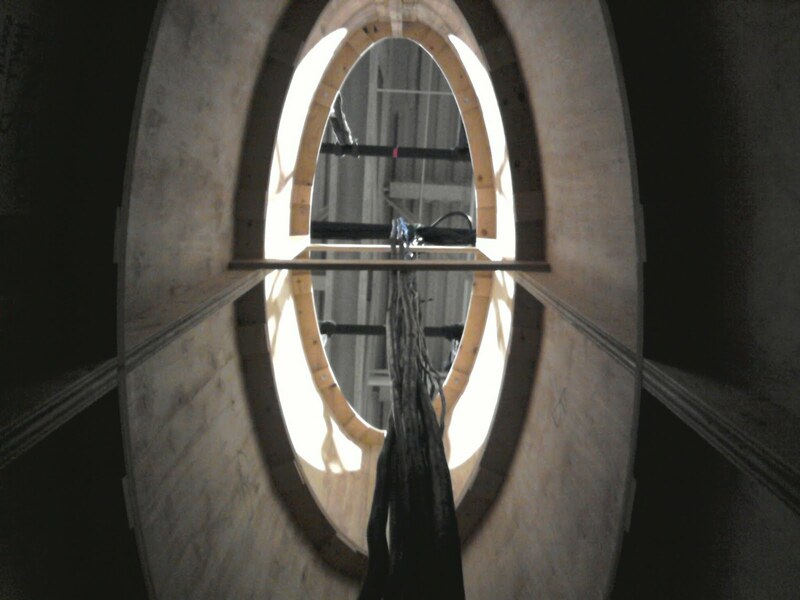 Instead of lifting each section on to the next, we had to clam shell the column halves around the giant anaconda of wiring, and lift it up enough for the next section. We would then fasten the 2 sections and raise both of them together. Then put the 3rd one under, fasten it, and raise 3. I don't mind saying I was a little concerned. We hadn't allowed for the top section to bear the weight of 4 sections below it. I was the lucky fellow who got to go inside this giant tube and do the fastening. However, the whole thing held up very well. No creaking or groaning was heard coming from the column! I spent what felt like an hour inside this crazy 'Vietnam hot box' fastening each section together, and making sure the wiring didn't get damaged as the truss raised ever skyward. 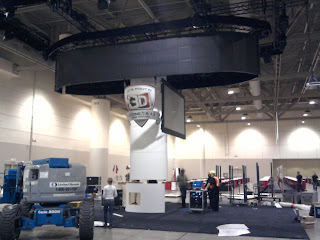 The "shield" panels got assembled and were also hung from the truss. 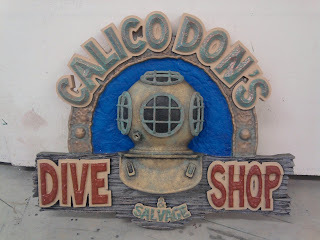 I had decided at the shop that the 6'X 6' graphic panels would be printed directly to 1/4" pvc sintra panes. We then put eyelets in them so we could hang them as well as bend them to a curve with aircraft wire. They looked really good after the were up. After the column was up and secure, we moved right onto the octanorm portion of the wall assemblies. This is a pretty sweet system. All the vertical posts were either square, round or octagon shaped. In these posts are channels at 45 and 90 degrees. All the cross-bars that fasten to posts have a torx head screw that moves a small 'gripper' that locks into the groove on the posts. One simple 180 degree turn of the screw locks the cross beam to the post. And it's a perfect angle! 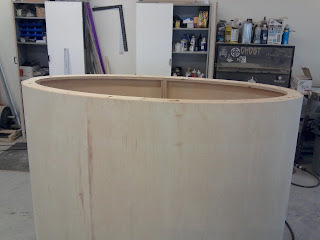 So we quickly made our way around the booth, connecting the pieces, sliding in the rigid wall panels, and moving to the next one. It probably took us a little more time than other people who use this system, as we had to comb through the crates to find all the parts we needed. At about 8 pm, I got a call that the fabric wall system wasn't ready to install. This kinda freaked me out a little as the show opens on Wednesday. However the company said that they were going to work on it all night, and that they would install the walls at 7 am Wednesday. I was glad about that as I couldn't bear the thought of this 1 day install now consuming 3 days! I haven't decided if I will go to the show or not. I think I would like to go, but the tear down is rapidly approaching, and I think I may have seen the inside of the convention center enough to last a lifetime!! This is where we left. I want to give a big thanks to Fiovo and Martin from Boothworks who were instumental in working late to solve the stretch wall problem and to heading down to the show early and install the last portions. 40 hours in a week!?!?!? The last week has been.........how do you say.............................very long. Yeah, that's it, very long. I split the ribs into 4 pcs per unit to get the best sheet yield. 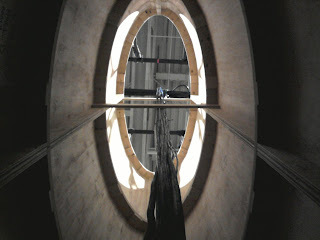 The holes were added to allow for retractable eye hooks. These hooks will pop up for us to be able to lift them on top of each other by the trussing system chain motors. Once un-hooked, they will drop into their holes to allow the stacking of the next section. We also put in alignment dowels to ease the pain of alignment. 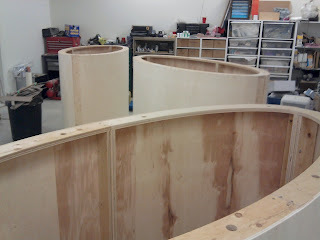 The sections were all framed in 3/4 ply and wrapped in Wiggle wood. These actually went together rather quickly. We left a 3/8" reveal around the bottom of each one to hide any slight seam mis-alignments. The bonus was that these are very light. Which is good as these will make for a very big tower! 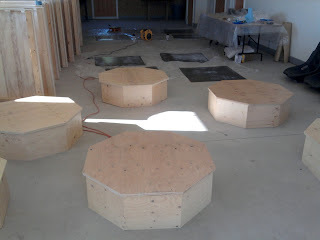 The other portion of the build was 8 double stacked octagon bases. 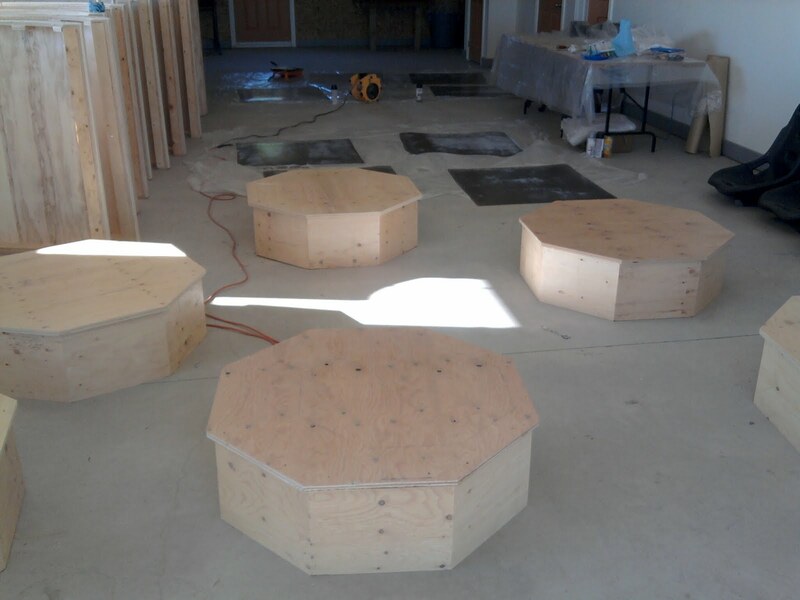 These bases have a 37" octagon on the bottom, and then a smaller octagon stacked on top of it. These two pieces will have a race car seat mounted to the top from which a person will get to play "Call of Duty" on a new format 3D television. The chairs we ordered were one of those "looks good in the photo". When they arrived they were less than stellar. I spent about an hour cleaning the seems up. As these chairs were polyproplene, I was able to flame the cleaned up seems to blend them smoother. 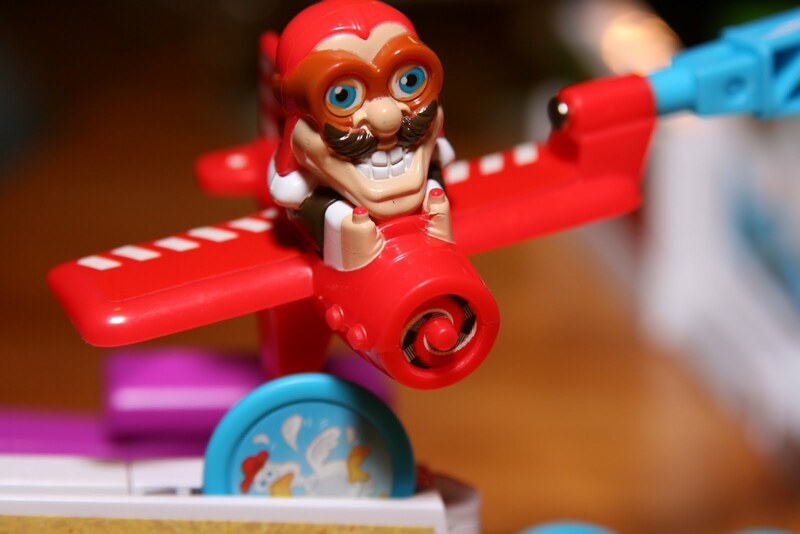 The other disappointment was the blow molded swirling of the plastic. They needed a new paint job, and fast! I headed out and picked up some "rubberized rocker guard" If you don't know what this is, it's basically a flexible rubber textured spray that they spray the rocker panels on cars with, to protect them from stone chips. After the texture was applied and dry, I clear coated them with a high flex, matte clear coat. We use Sherwin Williams 2 part automotive clear coats. These are HIGHLY durable, and apply easily. And despite what the label says about mixing, they are pretty tolerant of slight variations of hardener and reducers. And believe me, I have pushed the ratio to the max. Especially on a job where you are getting low at 3 am and don't have time to wait until the next day to get a little more! The paint job looks a little stripy in the pictures, but as the clear flashes off and they start to dry mat, that will disappear. Applying the laminate to the other parts was pretty straight forward, I really like the LePages water based contact cement. I had reservations about using it when it first came on the market a while ago, but I love it now! Plus, it's handy stuff to have for various other projects that require weird ways of doing things. This job was full steam ahead right until the delivery. In fact, we were building the skids this morning in order to deliver them today to the convention center. Today was a little interesting. In terms of delivery schedule, unloading at the show, etc. We delivered our portion, then had to head over to Boothworks to pick up the other portions. I hope I remember the installation instructions for the Octanorm panel supports. Good job they're on speed dial. Due to various other 'technical difficulties' at the location(there is a HUGE amount of A/V components in this booth, and these present their own set of problems) we didn't get very much installing done. So we are back tomorrow, but I am confident that everything will run like a well oiled machine. And it better not be a well oiled 'Death Machine'! Driving the globe in the bike lane! The last few days have been a little chaotic around the shop. 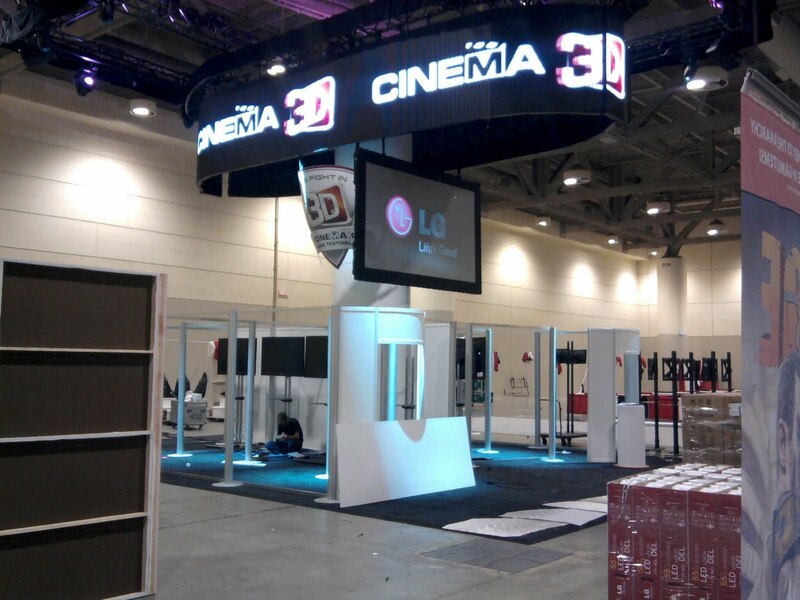 The unit next to us has been vacant for some time now, and as this trade show booth is gearing up rapidly, we have decided to take it for the rest of it's build. It will be a clean space for us to to do our arborite laminating as well as storage for the completed parts. 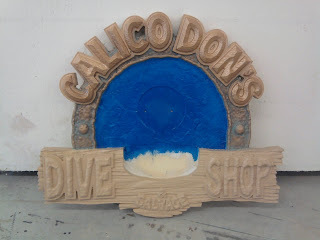 I was able to finish carving the sign support for the dive sign. That was put on hold right after our Techno cnc finished cutting it so I could move onto cutting a gigantic pile of 'Bike Lane' stencils for the city. These are pretty much the same as the wheelchair stencils, except that they are actually twice as big as them. We had to cut them in 2 pieces and 'hinge tape' them together for easier transport. Between using the right cutter/feed-spindle speed we were able to cut 9 at a time, and they were 99.9% as good as die-cutting the cardboard. I was very pleased! 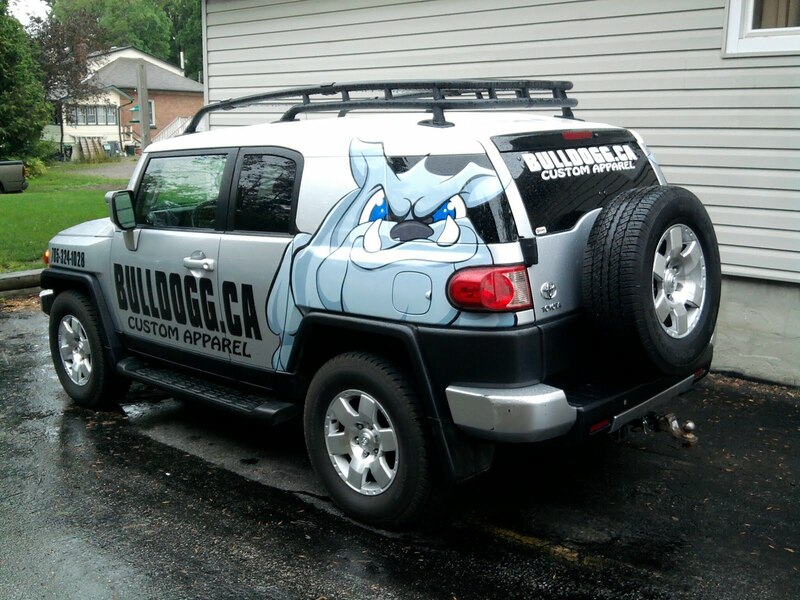 The other neat little job we have is for a local business called 'Bulldogg Custom Apparel' I had actually designed their logo about a year ago. They have a fun marketing plan they are gearing up for. 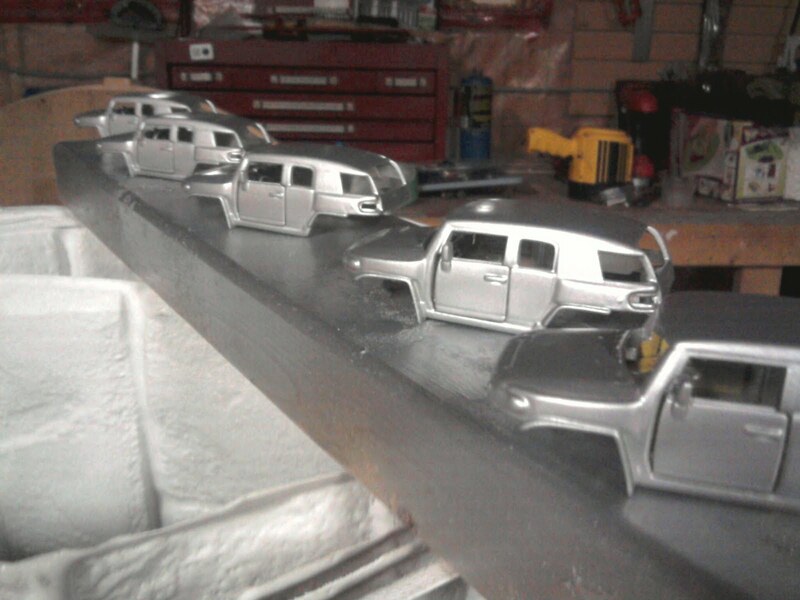 They're calling it 'Send the FJ around the world' The plan is to paint and wrap 5 TOY Toyota FJ cruisers to look just like their actual Toyota business vehicle. They want a scannable QR code placed on the roof that will take people to their facebook page. The plan is to have people photograph themselves with the toy, upload the pictures to facebook and then pass the car to someone else. They'll track the toy via the uploads and see how far it will make it around the globe. Ambitious AND fun. Good for them! So we purchased 5 toys and are painting them up now. Then we will print waterslide decals and clear coat the toys so the graphics will last. If anyone is interested, just look for the little grey dog on facebook under BULLDOG CUSTOM APPAREL. They have a page called Track the FJ. Well it's official! Our Death Machine will make it's debut performance at the Toronto International Film Festival in Simon Ennis's short film "Up in Cottage Country" This is great news for Simon. Congratulations! (I snagged the video from his FB page)! So I guess with any luck, I will be at the festival. After seeing this trailer, it inspired me to re-live the build journey by reading some of my old posts. It's funny now that some time has passed, how the stressful bits of the job have all melted away, and now it all looked so easy! I hope the posted video runs ok. It looks like a cool film, and not because I worked on it. Julian Richings (the general) is definitely one of my super favourite actors! Over the weekend I was able to find some time to start drawing up the bracket that will mount the sign to the wall. I thought a rough piece of wood would be perfect. 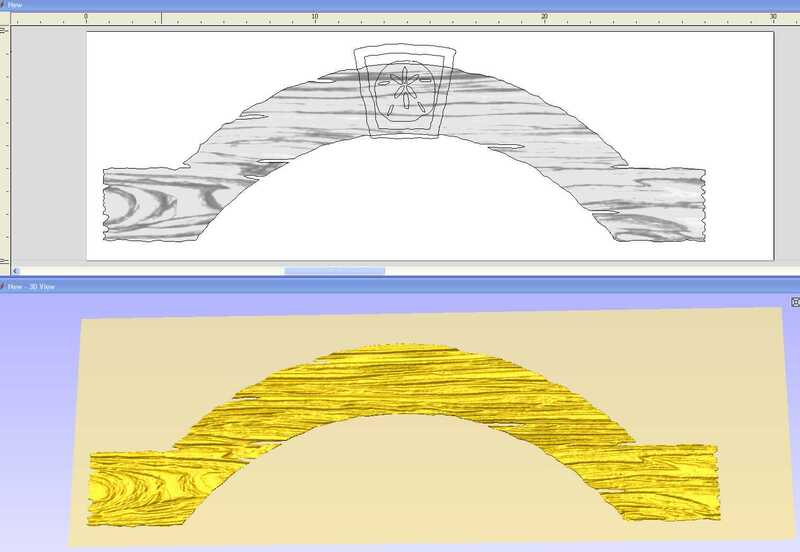 I created the arched vectors in Aspire, as well as the keystone and sand dollar. 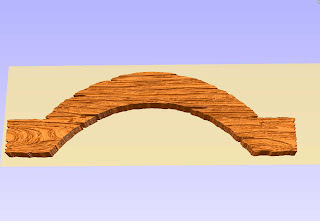 I then imported a woodgrain image I had and converted it to a relief. Those that haven't used Aspire would be VERY surprised at how easy this process is. The next step is to 'zero component outside selected vector'. 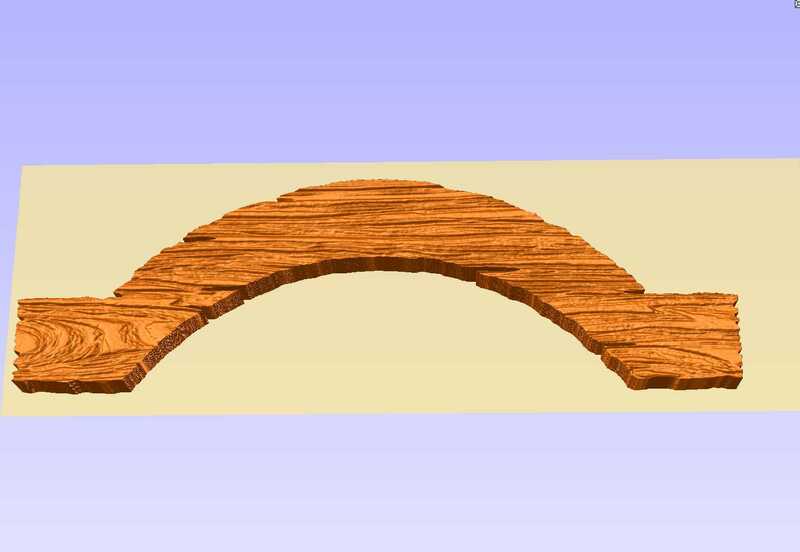 This function deletes the 3D woodgrain outside of any selected vector, in this case it was the outline of the curved bracket. I then added an arbitrary height of .75" to give it some thickness. I don't have my material that I will be making it out of handy, so I just made up any thickness for now. I will see what material is at the shop later and adjust things then. Lookin' good I think. Now for the 'keystone' at the top. 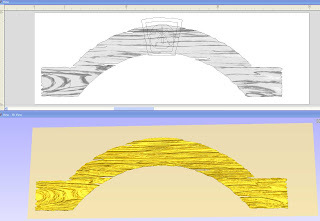 I selected the very outside vector of the keystone shape, and gave it a height of 1" This will make it stand proud of the woodgrain arch. I then added a bumpy texture from an image I created in Photoshop. 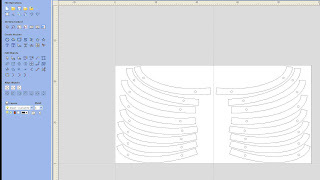 I selected the inner wall vector of the keystone and recessed it down around a 1/4". I then created a dome shape from the sand dollar outline I drew in the center of the keystone. The final step was to recess the oval shapes inside the sand dollar. I do use a bunch of different software for creating 3D objects, but for this sort of modelling, NOTHING is faster than creating it in Aspire. And fast is always good! After this, I just had to make the arch visible again by selecting it in the component list. 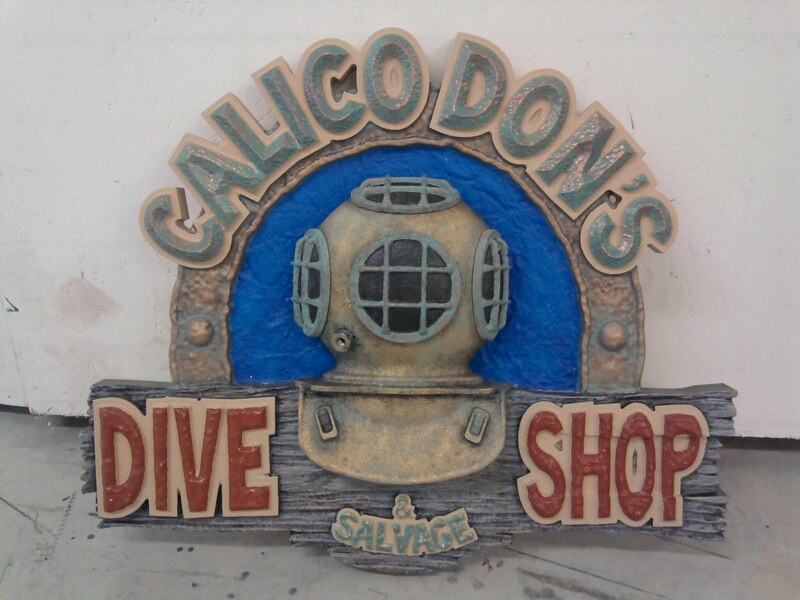 The sign will look good hanging from this by old rusty chains. 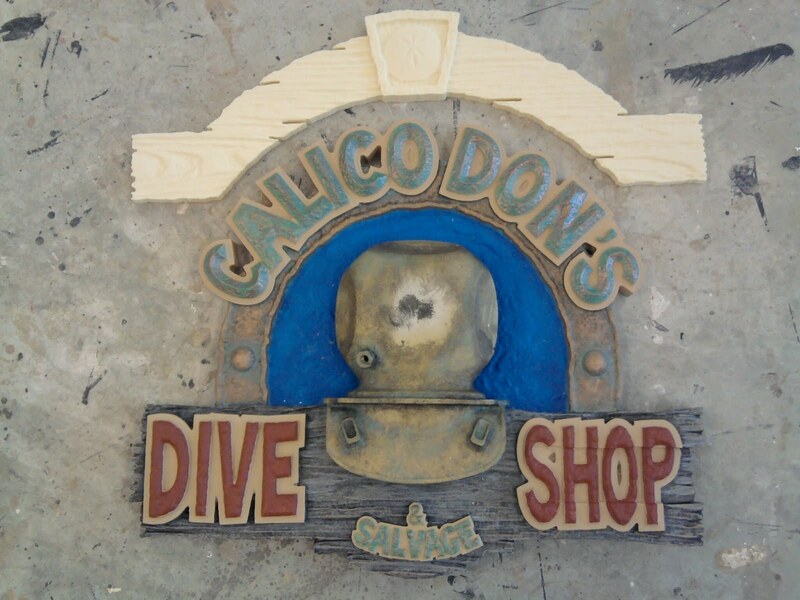 It is kind of making me want to start an old dive shop in Mexico. Maybe Cozumel. That's a career that would be fun! 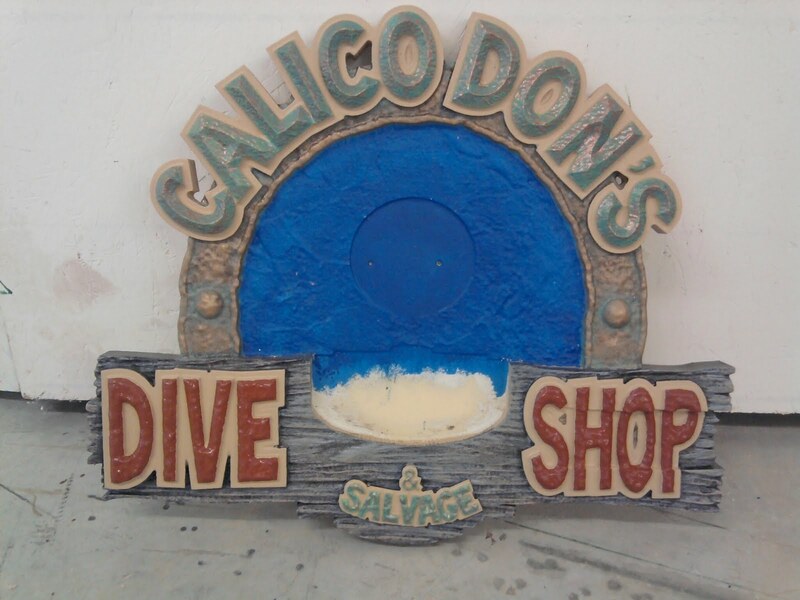 I scrounged up some time to get a little paint on the dive sign today. I had primed it yesterday between cutting vinyl and a delivery for another job. It is quickly coming together now. It will be a nice piece to hang on display in the other sign shop. I am really starting to like these kinds of signs. I may just make a killer sign for this kind of work, and put it out front of the shop. It would be great stuff to do between jobs. The helmet got all it's patina on it, and all that's left for that is to attach the porthole cages. Painting has been a joy, when I get the chance, and it moves along fairly quickly! I really should have done it double sided with a full helmet in the middle, but my HDU supply is getting low, and I can't get any more until late next week! I have decided to make a bracket with rusty chains that the sign will hang from. I think this will knock it out of the park. I have a bunch of styrene to machine for a friend of mine on Sunday, so I will be able to get more painting done as our Techno cnc chews out that stuff. With a trade show booth looming around the corner, I will have to paint fast! In this photo, the text has been done on the top, and the rust is just starting on the bottom text. The wood grain went really fast, as did the blue color. I couldn't wait to place the helmet and porthole cages in place for the photo. It can be a little like Christmas when the parts all start to come together! I excitedly got to the shop today to get the start of the Dive Sign going. I had already created all the vectors and the 3d helmet a couple of weeks back. Now that the router was free, I was going to get it cut today. I hadn't toolpathed the relief, which I thought that I had, so that kind of slowed me down at the start. 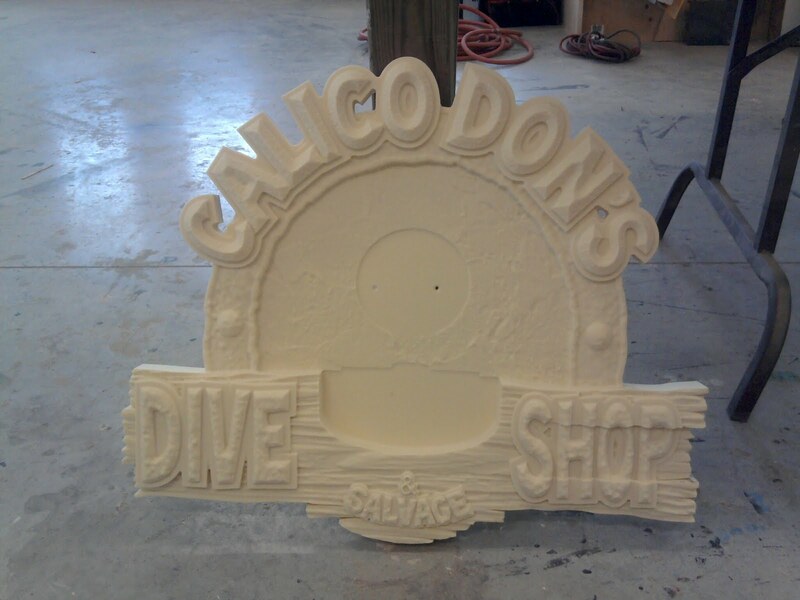 But before long, I had the signfoam screwed down, and our Technocnc fired up. 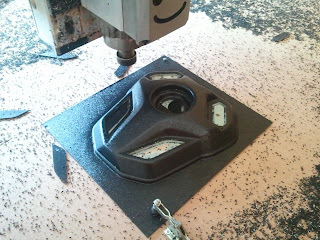 While that was running away, I was able to toolpath the rest of the parts that needed cutting. A couple of hours later, the parts were all machined and I started getting the primer on. This has been quite fun, from the design concept, right to the machining. I look forward to seeing it finished. Soon Jamie, soon. #Technocnc keeps us very busy! 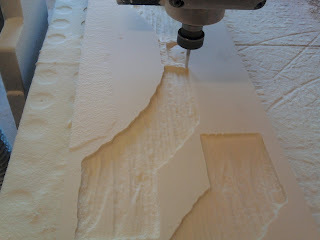 I am going to harp this blog on the benefits of owning a cnc router. This is a purchase that anybody who is involved in fabrication should be considering. I truly love my Techno cnc. I have said before that I have owned other machines, but Techno cnc is the one I stand by. There is no on-going compensation, or a bonus, or anything. My preference is Techno cnc, through and through. In order for someone to continually talk about, and continually promote a product, it has to be a reliable piece of gear, with exceptional customer service to back it up. 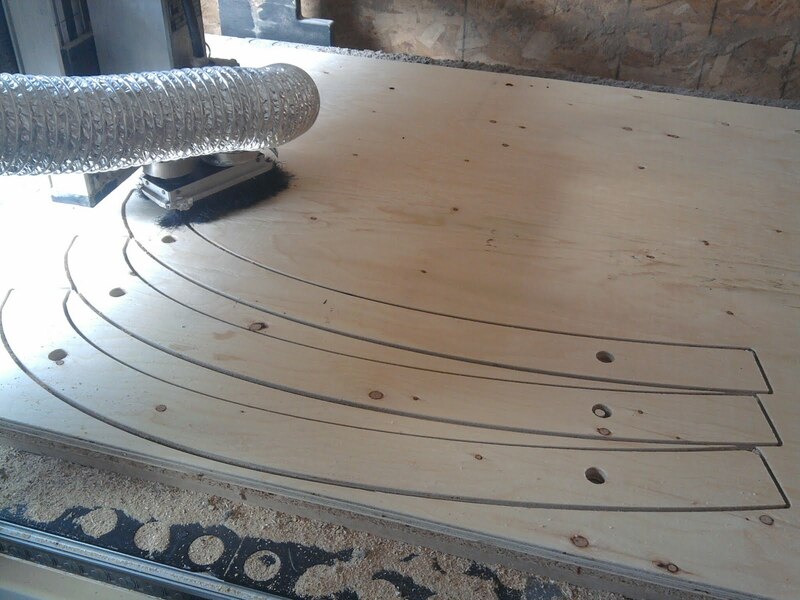 Most cnc router purchases will be paid off completely by the 6-8 month mark, due to the diversity that they enable. We are always getting jobs that aren't related to movies and television at all. This is a direct result of good marketing, and the equipment to back it up. With a return like the one I just quoted, a fabrication company will actually LOSE money in the long run by NOT having one. When I started, I was on a very limited budget for a machine purchase, so I had to get a 'less than ideal' used machine. Still, I learned haw to use it quite well. That machine was paid off on the first job we got it for. Pretty nice if you ask me. This opened up the way for a second machine purchase. This one was considerably more money, but paid off in 3 months. By that point, I was ready for a 'real' machine. 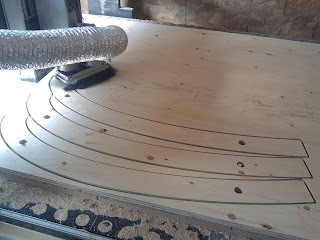 A Techno cnc router. Every time I fire up our Techno, I am assured it's going to do the job, and do it flawlessly, in record time. 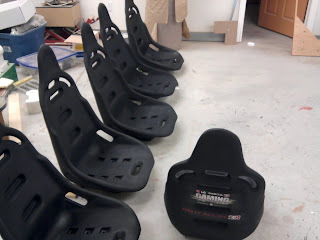 One of the last jobs we ran on it was trimming vac-formed shells for a Laser Quest game manufacturer. We originally machined the vac form mold for these vest plates, so getting us to trim the parts out of the vac-form sheet made sense. This kind of job is a far cry from 'props and sets', but shows how a Techno cnc can, and will, open the door to new business, regardless of the type of fabrication business your in. We have done custom wood mouldings for mansions, in-layed wood doors, styrofoam packaging prototypes, the list goes on and on. And we aren't in ANY of those businesses. Every time we do a run of these vests, there are between 50 and 100 pieces. Once the file is written, it just gets used over and over again. Another job I couldn't do without our router!